Contact lenses come in many types, categorized primarily into daily wear or extended wear. How can you know which type of contact lens is best for you? Each kind of contact lens has its own set of advantages and disadvantages. Your eye doctor will perform a thorough contact lens eye exam and fitting in order to determine which is most suitable for your eyes and vision. However, it’s important for you to be educated about your options. That’s why we compiled the following rundown of pros and cons for daily wear vs. extended wear contact lenses. These are by and large the most popular type of contacts, available in both hard and soft varieties. You insert them into your eyes in the morning and remove them at night before going to bed. Daily wear lenses are not made to be worn overnight, and taking them out gives your eyes an opportunity to breathe and rest. You must clean and disinfect daily wear contact lenses every time you remove them at the end of the day. This involves rinsing them with the cleanser that your eye doctor recommends and then soaking them overnight in disinfectant solution. Improper hygiene leads to a buildup of bacteria and deposits on your contact lenses, which can cause irritation and eye infection. Do not confuse daily wear with daily disposable contacts! Disposable dailies, one type of daily contact lens, do not ever need to be cleaned. They are single-use lenses that are taken out and tossed out at the end of each day. The next morning, you simply insert a fresh pair of contacts. Hands-down, these type of contact lenses offer ultimate convenience and health benefits, which has made them a widespread favorite. When daily disposable contact lenses were introduced to the market, they were very expensive. However, over the past few years, the price has gone down tremendously due to the advancement in technology on creating the material. Plus, most brands offer a rebate program of up to $200 on a year supply. Daily disposables are now a very affordable option. Many disposable contact lenses, of all varieties, also offer tints and colors that may accent your natural eye color or change your eye color altogether. Those with Presbyopia, multifocal, or bifocals normally would need to have bi-weekly or monthly contacts, although new daily disposable options are also beginning to emerge. It was once assumed that one can only wear contact lenses to a certain age. However, with the various options of these types of contact lenses, including daily disposable lenses, our Northeast Philadelphia patients are wearing contact lenses to a much more advanced stage in life. 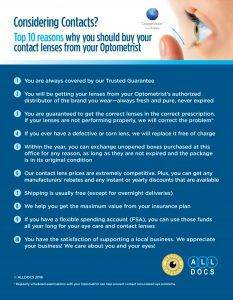 We love daily disposable contact lenses and highly recommend it to all our patients! If you have healthy eyes, a strong prescription, an irregular work schedule that doesn’t accommodate regular disinfecting of your contacts, and you crave ultra-convenience – extended wear contacts may be a great option for you. They come in soft and hard versions, and can be worn for about six to seven days at a time due to their very high oxygen permeability (they are five to six times more oxygen permeable than daily lenses!). Because extended wear lenses stress your eyes more than daily wear contact lenses, your eye doctor must determine that your eyes are in top health to qualify for these contacts. Deposits tend to build up on extended wear contacts, which can irritate your eyes and cause infection more commonly than daily wear lenses do. Why is eye infection more common with extended wear contact lenses? Keep in mind that during the day, your eyes produce tears that maintain moisture and flush away bacteria from your eyes. Yet when you snooze, tear quantity is decreased. In addition, when your eyes are closed, oxygen doesn’t get through. The combination of less tears and less oxygen can cause the contact lens to bind with your eye, which raises your risk of a corneal ulcer or eye infection. To combat these ocular health risks, eye doctors design wearing schedules for extended wear contact lens users. For example, your optometrist may advise wearing the lenses for a few days straight, and then removing them for a night.